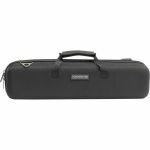 Notes: The new CARRY LITE DJ-CASE L is a very lightweight and compact carrying solution for your DJ-equipment and comes in a nice full-black matt finishing. Constructed from laminated MDF panels and anodized aluminium profiles the CARRY LITE design features a fully padded interior with a variable pick & pluck foam that allows to create individual adapted compartments for various-sized DJ-controllers such as Pioneer DDJ-SB2, NI Kontrol S2, Denon MC-3000 or most Hercules DJ-controllers. The pick & pluck foam consists of two separate layers providing the additional option to create another slot underneath the controller for laptop or cable storage. 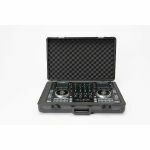 Notes: The new CARRY LITE DJ-CASE XL PLUS is a very lightweight and compact carrying solution for your DJ-equipment and comes in a nice full-black matt finishing. Constructed from laminated MDF panels and anodized aluminium profiles the CARRY LITE design features a fully padded interior with a variable pick & pluck foam that allows to create individual adapted compartments for various-sized DJ-controllers such as Pioneer DDJ-SR2, Numark NV2, NI Kontrol S4 or similar-sized DJ-controllers. The pick & pluck foam consists of two separate layers providing the additional option to create another slot underneath the controller for laptop or cable storage. Notes: The new Magma CTRL Case Dashboard is specially designed to protect the new Numark Dashboard display. Crafted from durable and lightweight Durashock molded EVA foam and a water- rejecting polyester exterior, it is furthermore equipped with an removable lid egg-crate foam that provides extra protection for the display and buttons. Notes: The new CTRL Case DJM-S9 is custom designed to hold the new Pioneer DJM-S9. Crafted from lightweight and rigid Durashock molded EVA shell it's a very compact and protective carrying solution that fits easily into the overhead bin or under the seat of most airlines. Notes: The new CTRL Case S2 MK3 a super lightweight and compact hard shell case, offering a safe and comfortable way to carry (incl. shoulder-strap) your NI Traktor Kontrol S2 MK3 controller. Made of lightweight and rigid Durashock moulded EVA shell, the inside lid is lined with high density egg-crate foam to protect the displays, jog wheels, and controls. Whether you are driving or flying to your next gig, the MAGMA CTRL Case S2 MK3 will be by your side throughout the journey. Notes: The CTRL CASE XL II is a super lightweight and compact hard shell case, offering a safe and comfortable way to carry (incl. shoulder-strap) your NI Kontrol S4 or Denon MC6000 controller. Made of lightweight and rigid Durashock moulded EVA shell, the inside lid is lined with high density egg-crate foam to protect the displays, jog wheels, and controls. Notes: The CTRL CASE XXL II is a super lightweight and compact hard shell case, offering a safe and comfortable way to carry (incl. shoulder-strap) your Reloop Beatmix 4Mk2 or Numark NS6 controller. Made of lightweight and rigid Durashock moulded EVA shell, the inside lid is lined with high density egg-crate foam to protect the displays, jog wheels, and controls. Notes: The new CTRL Case CDJ/Mixer is custom designed to hold various CDJ player or club-mixer models such as Pioneer CDJ-2000, CDJ-2000NXS2, XDJ-1000 or a DJM-900 NXS/SRT, DJM-900NXS2, Rane MP-2015, Allen & Heath Xone 43C etc. Crafted from a lightweight and rigid Durashock molded EVA shell it includes a customizable and protective interior foam padding that can be adjusted to snug fit any 12"-sized CDJ-player or mixer model. Notes: The new CTRL Case S4 MK3 is a super lightweight and compact hard shell case, offering a safe and comfortable way to carry (incl. shoulder-strap) your NI Traktor Kontrol S4 MK3 controller. Made of lightweight and rigid Durashock moulded EVA shell, the inside lid is lined with high density egg-crate foam to protect the displays, jog wheels, and controls. Whether you are driving or flying to your next gig, the MAGMA CTRL Case S4 MK3 will be by your side throughout the journey. 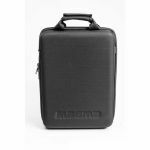 Notes: The Magma CTRL Case XXL Plus is a lightweight and compact hardshell case to protect your Roland DJ-808, Pioneer DDJ-1000, XDJ-RR or similar sized controller. The CTRL Case XXL Plus is crafted from durable Durashock moulded EVA foam and a water rejecting polyester exterior. The lid is lined with high density egg-crate foam to provide extra protection for all control knobs, faders and jog wheels. Notes: The CTRL Case NV2 is a super lightweight and compact carrying solution for your Numark NV2 Controller. The case is crafted from lightweight Durashock moulded EVA foam and water repellent polyester exterior. The lid is lined with high density egg-crate foam to protect the displays, jog wheels, and controls. Notes: Customized to hold the Pioneer XDJ-RR2 DJ-Controller. Crafted from 9 mm vinyl laminated plywood, sturdy aluminium profiles and heavy duty butterfly latches, this case provides ultimate protection for mobile use on the road. Notes: The STOKYO original cartridge case with some minor updates. Notes: STOKYO has created the perfect cartridge case based on input from some of the top Professional DJ's from around the world. Holds up to 2 cartridges of both concorde and regular headshells and comes with a secret store away compartment for extra stylus or other accessories.